You don’t need to break the bank to make a luxurious dinner. 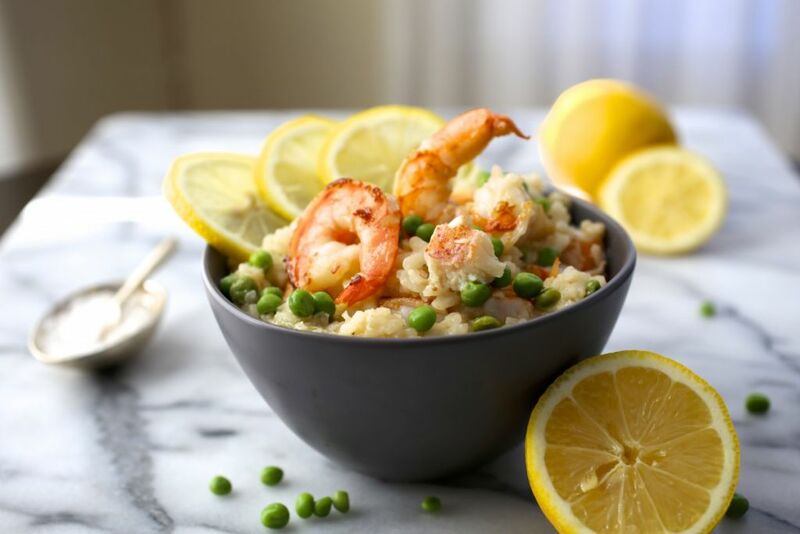 Shrimp and Lobster Risotto packs a ton of flavor into a comforting rice dish. For years my best friend, Heather, and I would hang out on New Years Eve at one of our apartments (usually on the Upper West Side of Manhattan where we grew up), where we would drink champagne and sigh about how nice it was to not be in an over-priced bar annoyingly packed with drunk frat boys and tourists. We’d watch the Times Square shenanigans on TV and chuckle about how cold and miserable everyone looked when they didn’t think the cameras were on them. Inevitably, by 11:30 we’d be in full blown panic mode, convinced that we were missing out on the most amazing time ever, so, wild-eyed and twitchy, we’d race down Amsterdam Avenue, pressing our faces up against every bar window, cursing ourselves that we didn’t pay the $65 cover charge earlier because now they’re full and everyone inside seems so happy—why are they so happy—how come we’re not in there—let’s check that bar across the street! By 11:55 we’d be pounding our frozen fists against the door of some random dump like Dustin Hoffman in The Graduate, begging anyone to take pity and sell us a $25 glass of supermarket champagne. Happy new year! What I’m trying to say is GOING OUT ON NEW YEARS EVE IS FOR SUCKERS. Luckily, Matt agrees with me so we’ve developed our own tradition (stolen from my dad and step-mom) of steaming lobsters, getting the best French fries we can find and eating everything as messily as possible on a table covered with newspapers and butter drips. Heaven. I should add that we always steam an extra lobster in case a hungry stranger shows up at our door so we can make something with it the next day. So what to do with leftover lobster? Of course you could make lobster rolls but why not make risotto! Obviously you could also cook lobsters specifically for this recipe (tips for steaming lobsters below). We also added shrimp because we only had one small lobster left. 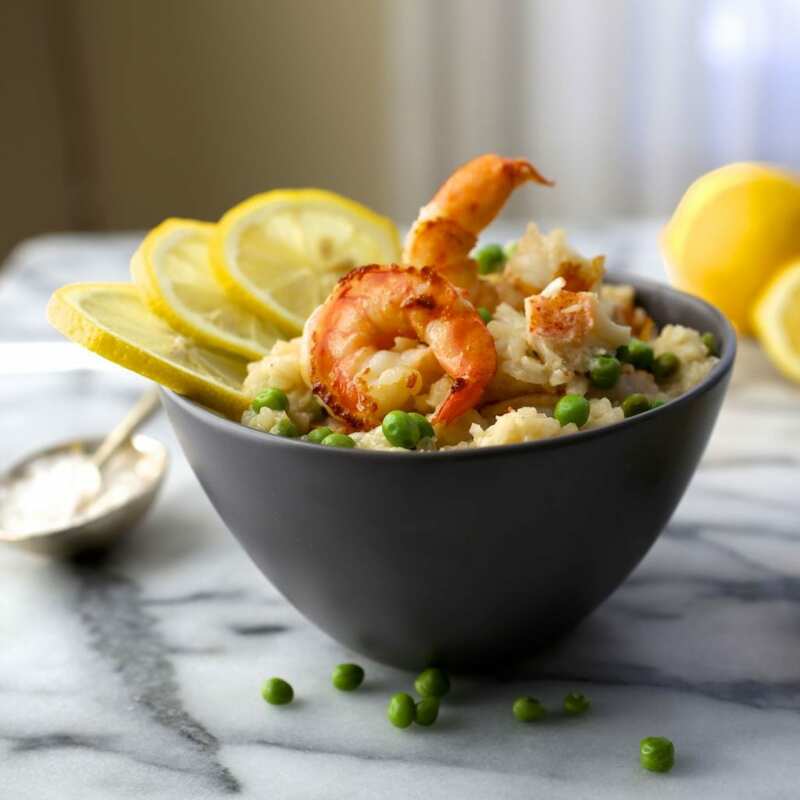 One of the great things about this recipe is that, though it seems really decadent, two lobsters will feed six people, and nothing is wasted since you use the shells to make a flavorful broth to cook the rice with. Fancy and thrifty! Separate the lobster meat from the shells (reserve shells for stock). Chop the meat into ½ inch pieces, place in a bowl and and keep in the refrigerator until needed. If using shrimp, shell them (reserve shells for stock), cut into ½ inch pieces (maybe leave one to 2 whole for presentation if you want) and place in a separate bowl from the lobster. Set aside in refrigerator. 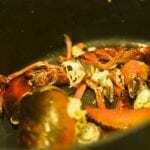 Rinse the reserved lobster and shrimp shells, including the heads, of any residue. Place all the shells in a large pot and add 3 quarts of water, peppercorns, bay leaf, and leek. Bring to a boil over high heat, then reduce the heat to medium low and simmer for 1 hour. Strain the broth through a fine-mesh strainer set over a medium saucepan. Set the strained broth over low heat and keep it at a bare simmer. In a large wide pot or Dutch oven, heat the oil and 2 tablespoons of the butter over medium heat until shimmering. Add the shallot and a large pinch each of salt and pepper and cook, stirring often, until the shallot is translucent, about 5 minutes. 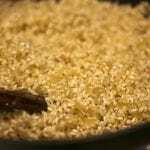 Add the rice and cook, stirring, until the kernels start to crackle, about 1 to 2 minutes. Pour in the wine and stir constantly, until all of the liquid has been absorbed, about 2 to 4 minutes. Pour a ladleful of the simmering lobster broth over the rice. 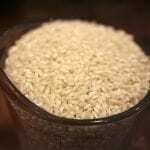 Let simmer, stirring constantly, until the rice absorbs the liquid. Continue adding the broth, stirring and letting it absorb, until the rice is al dente, about 20 to 25 minutes (you may not need all of the broth, but if you run out, use hot water or chicken stock). Taste as you go for doneness, seasoning with salt and pepper as needed. When the rice is almost done, remove from heat and stir in peas and raw shrimp (if using). Cook for 5-7 minutes until shrimp are opaque and just cooked through. Then stir the reserved lobster meat, Parmesan, butter (if desired), chives, lemon zest, and lemon juice. Taste and season with more salt, pepper, Parmesan, and lemon juice as needed. Just before serving, loosen the risotto to the desired consistency with a little more broth or hot water and serve immediately. Drizzle each serving with olive oil. To steam the lobsters, fill a large pot with a tightfitting lid with 1 inch of water and stir in 1 tablespoon of kosher salt. Add a steamer rack to the pot. (If you don’t have a steamer rack, bunch a long piece of aluminum foil into a rope and twist it in the bottom of the pot). Bring the water to a boil over high heat. Add the lobsters, head first, to the pot, cover, and return the water to a full boil. Reduce the heat and cook at a gentle boil until the lobsters are bright red, about 12-14 minutes. Check their doneness by pulling on an antenna: If it comes out with no resistance, the lobster is done. Make enough risotto for leftovers (you’re going to want to make Crispy Risotto Cakes with Taleggio Cheese, trust me). If you don’t feel like making lobster stock, use a good pre-made fish stock. You can use regular yellow or spanish onions in place of the leeks (in stock) and shallots (in risotto). This post is hilarious. I am jealous of your Jesus/Buddha-like enlightenment regarding New Year’s Eve plans. Bless your dad and step-mom. (also- stealing this tradition- WHERE HAS IT BEEN ALL MY LIFE??) This recipe sounds amazing. I got a little lost and distracted when you mentioned “leftover lobster”. What is that mythical beast??? Then you mentioned cooking it just for this recipe and I was back with you. MMMMMMM!!! I sort of want to be adopted by you and move in. If my husband says it is ok then can I? ….. no really… Can I? You might have to take him too. That’s cool, right? I’ve asked Matt and he says YES! We’ll get the paperwork together and you and Larry pack up your things and your adorable pup. Actually, let’s all live in your house instead. I’ll still cook as long as you guys decorate. And maybe next year the Cliftons and the Sansones should have a crustacean feast together!!! Dreamy. YES!! We will get to work planning. I hope the chickens all get along. When are you coming to San Francisco? I want to cook with you! Nicole was so very right to guide me to your blog…LOVE it! Awww, thanks Paul! So glad you’re enjoying it. And I LOVE San Francisco so don’t be shocked to find us on your doorstep one of these days (with Lemon Bars, of course). Matt and I had a laugh last night about the phrase “cooking with someone”. Nothing like cannibal humor on a food blog. To be fair, it’s -3 degrees here and we were probably hallucinating.